With expanded coverage of persuasion, new end-of-chapter exercises, fully integrated technology, and new up-front material designed to get students ready to present right away, the Seventh Edition of Public Speaking is more interactive and student-focused than ever. Centered around three core objectives--preparing students for civic life, respecting the diversity of the auWith expanded coverage of persuasion, new end-of-chapter exercises, fully integrated technology, and new up-front material designed to get students ready to present right away, the Seventh Edition of Public Speaking is more interactive and student-focused than ever. Centered around three core objectives--preparing students for civic life, respecting the diversity of the audience, and sensitizing students to the ethical impact of their words--the text continues to offer both practical advice for public speaking and an understanding of why such advice works.The Seventh Edition introduces two models of oral communication--the Mechanical Model and the Identification Model--designed to help students better understand the elements that influence oral communication. The Mechanical Model addresses the physical and technical constraints that shape communication, while the Identification Model points out the ethical consequences of oral communication. These concepts are brought to life through examples from real, student, and professional speeches; new Discussion and Application exercises at the end of each chapter; and a variety of boxed features throughout the text. While the trusted content and distinctive features of the text have been maintained, Public Speaking, 7/e, continues to evolve and adapt to changing times and the needs of its student audience.New! Integrated Technology icons in the margins provide instructors with a turnkey solution to technology by pointing students to interactive exercises and resources on the newly updated VideoLab CD-ROM and revamped Online SpeechStudio in Eduspace.New! Stairway to Speech Success Model in Chapter 3, Your First Speech, lays outthe speech development process from start to finish to help students get started on preparing their first presentation. 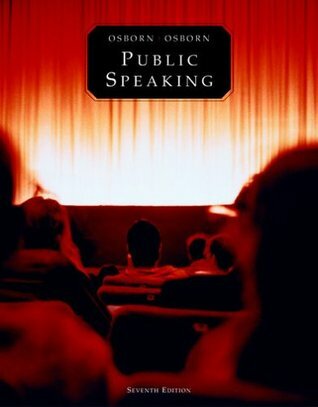 Osborn, Public Speaking, 7/e, is one of the only books to have a full chapter dedicated to the first speech. A student' s first speech can often be one of the most challenging assignments for both the student and instructor since students have to present before learning how to develop and deliver a speech. This chapter helps to facilitate this first assignment.New! Discussion and Application Exercises at the end of each chapter allow students to practice skills in small group settings or on their own. These varied activities can be used in-class to promote discussion or assigned as homework.New! Chapter on Communication Anxiety (Chapter 2) addresses this important subject when your students need it most--as they are preparing to give their first presentation. This chapter flows well into Chapter 3, Your First Speech.New! PowerPoint Tutorial at the end of Chapter 11 offers instructions (including screenshots) on how to operate PowerPoint and how to use PowerPoint as an element of a presentation.Enhanced coverage of Persuasion--Chapters 15 and 16 have been restructured to provide a clearer, more ethically defensible discussion of persuasion. In addition to expanded coverage on ethics and forms of proof, the concept of argumentative persuasion has been developed to emphasize the ethical importance of reasoning in areas such as the formation of public policy. Also, a new section on Listening to Persuasive Speeches addresses both how to be a thoughtful, active listener, and how--as a speaker--to anticipate and respond to questions from listeners. Chapter 16also introduces the Toulmin model of proofs to help students grasp how to make reasoning work productively in persuasive efforts.Updated InterConnections.LearnMore boxes connect students with sources of additional information on the Internet. These boxes have been updated and added throughout the text.Updated Ethics Alert! boxes highlight ethical concerns or issues as they arise in the context of content, rather than confining the subject to a chapter on its own. The authors believe that isolating ethics in a separate chapter diminishes the importance of ethics in public address. These boxes have been updated and added throughout the text.Annotated Sample Student Speeches illustrate how the theories and principles discussed apply in real life. The Seventh Edition uses more real-life examples of student speeches than any other text on the market.Updated Speaker' s Notes provide students with useful suggestions for improving their presentations, and reinforce key principles and concepts. My copy is rather outdated. It lauds historical figures that have since been revealed to be anywhere from flawed to profoundly corrupt, although their status as heroes grants them some immunity from exposure depending on the nature of their sins.That aside, it's really just a big book of tips. They're useful tips but you've probably heard them all before. You could probably get through a public speaking course without this book, honestly, because it's practicing that's the hard part. I have this book because the university bookstore would only give me 75 cents for it, so there it sits, a good reference book for the distant future when I teach my children about public speaking.